Waterproof is one of those terms that seems absolute, but once you get out on the trail and the heavens started dumping, a lot of "waterproof" jackets prove anything but, quickly transforming into lumpy, wet deliverers of hypothermia. So far, I have to admit, the RSX is living up to its marketing hype—it hasn't let in any water at all. NeoShell is impressive stuff. With its 10,000 mm waterproof rating, the RSX jacket has the same wind and precipitation-blocking capabilities as most hardshell jackets. The taped seams also help keep leaks at bay. I need more time in the wet before I offer any kind of verdict on the jacket’s waterproofing (all DWR finishes wear out with time and exposure to dirt), but so far so good. 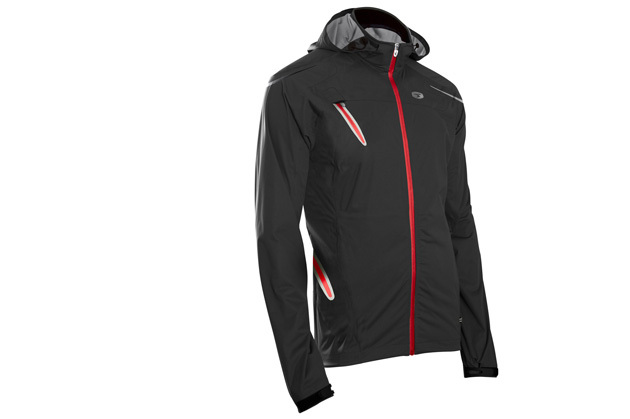 Sugoi claims that the RSX offers all that rainstorm immunity while possessing unrivaled breathability. The company is so confident in the NeoShells' ability to usher moisture away from your skin that it has omitted pit zips (or any kind of vents, for that matter) entirely. I'm still not entirely on board with that decision. My rides tend to include some fairly long and steep climbs and I've found myself unzipping the jacket every time to keep from steaming myself alive. Try that in a decent rainstorm and it kind of makes wearing a jacket pointless. Again, I'm going to spend more time with the NeoShell before I offer up a final judgement, but after a dozen or so rides in this thing, I'm leaning toward: I don't care how high-tech NeoShell is, I just wish this thing had pit zips.